If you are looking for a unique team-bonding exercise that ignites team spirit, friendly competition and creates infectious excitement, look no further! 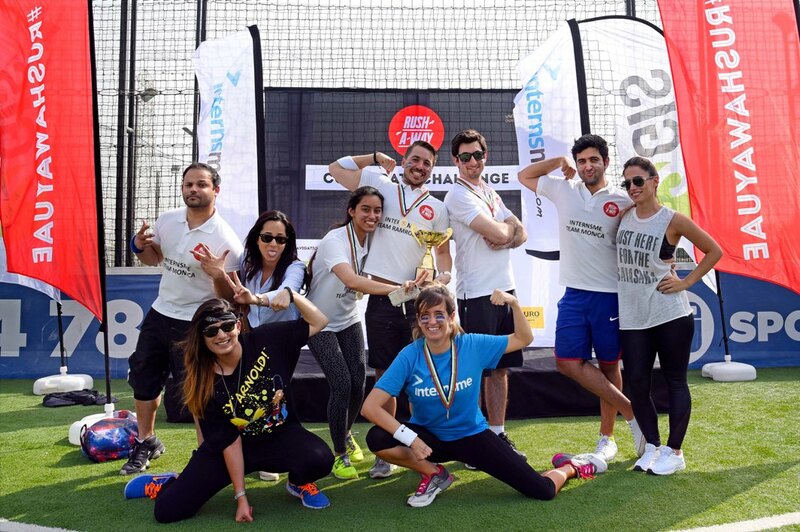 Dubai's thrilling Corporate Challenge is back on Saturday, 29th April 2017! Rush-A-Way Corporate challenge is an inter-company competition that guarantees an exciting day out for teams in a unique team-building format to strengthen team bonds and ignite team spirits! Teams from 50 different organizations will compete to conquer 7 challenges in an exhilarating adventure around Dubai, to win the coveted title. Teams of 3 - 4 members, will tackle 8 unique challenges around Dubai. In their endeavor, teams will test their mental and physical fitness, quick thinking and teamwork, all while having a blast! Each team of 3-4 members, will face a total of 7 challenges. Each Challenge spread across unique locations around Dubai. Each challenge can be performed by any 2 members in the team, who need to complete the challenge in the shortest time possible to score maximum points. The challenges are designed to test participants on a variety of skill-sets like speed, logic, fitness, accuracy, perseverance and more importantly, teamwork. The 7 challenges are not revealed before the event, although you can have a fair idea on what to expect by seeing our previous event videos. At each challenge, teams earn points based on how fast they complete it. The team with the highest score at the finish line wins the pride, prestige, the grand title and the grand prize worth AED 15000. 2nd and 3rd spot winners win prizes worth AED 10,000. Special discounts can be availed for a group of 13+ participants. Corporates sending larger groups will also be eligible for winning the Excellence Award and the Best Performing Company award. Contact us at info@rushawayuae.com to avail the special offer price. The contesting teams will navigate through 7 unique challenges set across Dubai. Each challenge can be performed by any 2 members of the team. Once the challenge is completed, the location details for their next challenge are unlocked on the Rush-A-Way web interface (web-app). All challenge details, location clues, time-keeping and other communication during the challenge will be through the web-app, which the team members can access from the Rush-A-Way website, through their smart phones. Teams are free to use GPS or access the internet, to navigate between locations. At each challenge, teams earn points based on how fast they complete the challenge. The teams with the highest score at the finish line, wins the Grand Title! WHAT KIND OF CHALLENGES CAN BE EXPECTED? Well, that information is classified. Some of our past challenges included Stand-up paddle-boarding, archery, go-karting, calisthenics & parkour, escape games and even sushi making. Check out our previous challenge videos, to learn more about our past challenges. Since each challenge is performed by any 2 members in a team, get to know the strengths and skills of each your team members. This will help your team select the most suitable team members who can complete the challenge fastest, making your team score the maximum points! And remember, whatever we make you do – make sure you RUSHHHHH. WHAT IS THE PARTICIPATION CRITERIA? Each team needs to represent one company and can have between 2 – 4 members. Rushers have to form their own team, as registration for solo participants is not available. Each contesting team needs a car to travel between challenge locations. Challenge Awards – Medals, trophies and prizes presented to the teams in 1st, 2nd and 3rd place. Excellence Award – presented to the organization with most entries, recognizing their focus on employee development. If you have a group of more than 12 members, call us to avail a 10% discount. Chance to win a pride, prestige and 25,000 worth of prizes! The reporting location details will be sent via e-mail to all participants. It will also be updated on our website two weeks prior to the challenge day. HOW DO I PREPARE FOR THE CHALLENGE? Teamwork and communication with your teammates play an important role in your performance. So get to know your team members well. Get familiar will all the rules of the challenge before the event kickoff. Wear comfortable clothes and shoes. Report on time at the starting point. Make sure your smartphones are charged. Your smartphones assist you during the challenges and are also required for receiving all location and challenge instructions. You could also use a phone charger in your car or carry a power bank with you to keep your phone charged. Make sure to fuel up your car in advance.